Former Sierra Leone captain Ibrahim Kargbo, who is currently banned from playing in Netherlands over match-fixing allegations, has joined English non-league side Dulwich Hamlet FC. The 34-year old, who previously played for Welling United, says he has signed a one-year deal with the London club. 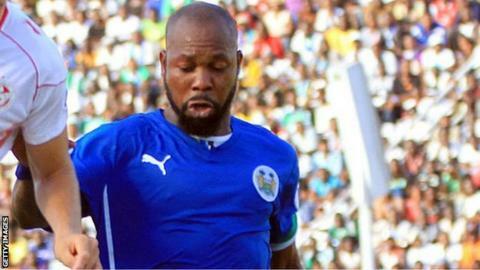 "I'm happy to sign for Dulwich Hamlet and I know I can still play well," Kargbo told BBC Sport. "I'll do my best to help the club achieve its objectives next season." He added: "I'm grateful to Hamlet FC as they have confidence in me at a time when I've been wrongly accused of fixing matches." Kargbo is banned in Netherlands because Dutch football's governing body, KNVB, have alleged he was involved in trying to fix games in 2009 - claims he denied three months ago. He is also among four players who are suspended by the Sierra Leone Football Association (SLFA) for allegedly attempting to fix Sierra Leone's 2010 World Cup qualifier against South Africa in Pretoria, which ended in a goalless draw. The others are Ibrahim Koroma, Samuel Barlay and goalkeeper Christian Caulker. All four players claim they are innocent. The allegations have yet to be investigated by the SLFA. Kargbo, who retired from playing for Sierra Leone in October last year, started his career with local club Old Edwardians before moving to Europe to play in Belgium, the Netherlands, Azerbaijan, Portugal and now England.